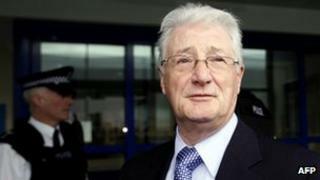 A retired British man being held in the US for allegedly conspiring to sell batteries for use in Iranian missiles has seen his first court appearance delayed. Christopher Tappin, 65, from south-east London, was extradited on Friday. He is being held in isolation at his own request at a prison in El Paso, Texas. Mr Tappin was originally due to appear in court on Monday. The hearing will now take place at 14:30 CST (19:30 GMT) on Tuesday. The British Embassy says it has made contact with Mr Tappin through his lawyer. At the court hearing, he will be informed of the charges against him. A date will then be set for a bail hearing, likely to be later this week. He denies trying to sell batteries for use by Iran in Hawk missiles and says he has been the victim of an FBI sting. The BBC's Jonathan Blake in Washington said Mr Tappin's lawyers say they will argue "vigorously" for him to be granted bail on the grounds that he is not a danger to the public or likely to abscond. If convicted, he faces up to 35 years in jail. Mr Tappin, of Orpington, fought against his extradition through the British courts who ruled that his extradition was lawful. The European Court of Human Rights in Strasbourg has refused to intervene. US Secretary of State Hillary Clinton has said that under the UK-US extradition treaty, certain procedures had to be followed and that was what had happened in Mr Tappin's case. On Wednesday, Prime Minister David Cameron said that Mr Tappin's case had been thoroughly considered by Home Secretary Theresa May - but that she was also looking carefully at the full findings of last year's extradition review. Critics of the treaty say it makes the extradition of British nationals easier because the US authorities have to produce less evidence to support their case. But last year, a massive review of extradition by a senior judge found that the treaty was fair to British citizens.